I am quite interested in the movie industry and particularly its evolution with respects to technological changes. Yesterday, Netflix was officially launched in Canada. I thought it would be interesting to post something on the subject of online streaming. Netflix is a pioneer in alternative movie rental schemes, starting off with an innovating no-late fees model, where customers can choose movies online and receive them by mail and keep them for an unlimited period for a monthly fee. Netflix also is making important inroads in the online streaming model, which is also offered in Canada as of yesterday. The widespread use of DVDs and the increasing popularity of video clubs sparked off a rapid transformation of moviegoers. The watching of films became more about the small screen than the big screen. This was the first Hollywood revolution. In the words of Theodore Levitt, Hollywood had been suffering marketing myopia at the time since the sector of activity was too narrowly defined to “movies” as opposed to entertainment as movie moguls denied the inroads TV had been making. Today, a new revolution is happening and the battling ground is not in your living room but in the virtual world. Hollywood has still not adequately answered to the increasing popularity of streaming videos online. Many models are out there, some legitimate and others that may be categorized as piracy. In order to have a better view of this revolution, let me lay out what is at stake and who are the players. Using its already much appreciated ITunes platform, it is possible to rent movies online and watch them from a computer. The movie is streamed and made available for 24h. Prices range from 3$ - 5$ depending on the age of the movies. Apple is also rumored to be developing an interface to tap in the ITunes application with the already existing set-top box, Apple TV, which would let viewers download movies and watch them on a television screen. Since this past May, Best Buy owns the right to run Cinema Now, an on-demand service that can be used through Blu-Rays and other home cinema systems. Best Buy plans to leverage their Blue Shirt and Geek Squad services with this new offering. With 9.2 m broadband subscribers, Time Warner has a massive customer base for online streaming. The cable company and Disney have been negotiating in the past month to establish an online channel with content provided by Disney. A deal has yet to be reached. Apparently the Japanese company is vying to get a share of the online streaming market by developing a streaming service that could be used with the PlayStation game consoles and other electronics with connectivity such as the Bravia TV set. Netflix is the champion and pioneer of online streaming movies and is making important inroads by getting some of the big movie companies to hop in the online streaming boat. Nintendo and Netflix struck a deal to let Wii users watch movies using the device. This model gives more control to the service provider because proprietary hardware is used to deliver the service, however it incurs upfront costs for customers who have to buy a machine. Apple TV, Sony and Nintendo use a box to deliver content, however in the case of Sony and Nintendo, game consoles also have other uses therefore the delivery of movies become an complementary offer. One important advantage here is that these devices can be hooked to a TV directly which allows a better viewing experience. ITunes is the software that Apple uses to deliver the content, though similar to directly online streaming, software that manages many types of media also becomes a powerful option. The most simple option technology wise is to stream content directly on a website, although this is limited to browser compatibility and hardware compatibility issues. • Substantial upfront investment – the hardware and infrastructure required to set-up a high-performance online streaming platform definitely represents a barrier to entry for potential entrants. • Partnerships with content producers – without partnering with movie producers, there is no product to deliver. Only with the agreement of the producers will the company delivering the media be able to use the content. The same is true for the traditional brick-and-mortar video stores that rent out movies. • Technology – the bandwidth available is essential to the success of the online streaming platform since low bandwidth will impede customers from enjoying a smooth viewing experience. A technology that is also secure and that can limit threats to privacy and fraud will also be a sine qua none condition for the online streaming platform to succeed. • IP laws - strong intellectual property laws that are enforced, coupled with a social awareness of piracy and a social stigma attached to illegally downloading and copying movies are also necessary to convince businesses that online streaming is a profit-making opportunity. • Social trends – the adoption rate of the internet and the relative trust that people have in purchasing over the net are important factors for the online streaming platform. • Customer base – at this stage, I would also add a strong customer base as a prerequisite to succeed in the field. Law school is grueling! I do not recommend it to anyone with a right mind. However, I am embracing it completely with a mindset apparent of that of a 2 year old that generally has a vocabulary of 50 words and can only make simple sentences. This means my legal vocabulary is rather limited at this point. Everything is novel, curious, challenging and, more importantly, interesting. I am feeling that I am in for a treat. A gift of wisdom from my peers and professors who are all supremely clever and dedicated individual. I am receiving a gift that opens doors, procures certain powers and generates possible riches. What am I in it for? Well a bit of everything, a bit of nothing. I am not sure a law student can answer this question honestly and adequately. But I now know that I am at the right place. I hereby declare, that no matter what happens from now on, I, Joel Kwan, will still be the same Joel Kwan when I become a lawyer. My friends will be friends, my family family and my heart will be at the same place (that is, the right place). Since this is back-to-school time, I thought it would be interesting to look into financial valuations of education programs. It might seem a cynical exercise to do so since such exercises strictly examine the economic benefits and costs, whereas sentimental values of studying in certain fields are omitted. In introductory finances courses, business students learn various methods to evaluate the value of projects that require investments, have future cash flows and respective levels of financial costs. For instance, a typical valuation problem a business student would get is the implementation of an IT system. The most prevalent method at least in introductory finance courses is the net present value (NPV) method which, in simple terms estimates the value of future cash flows generated by a project and reduces them by a discount rate which is a measure of the cost of using the capital of the project. The amount of initial investment is then reduced by the initial investment. This end result is the NPV and represents an estimated value of the project. Naturally, the NPV must be positive in order to be worthwhile. Now, a general model to calculate the NPV of an education requires lots of assuming and guessing, but for the purposes of the exercise here are the steps to calculating the net present value of your education. I will also set forth an example with an imaginary person. Assuming one would at least complete high school education, estimate the kind of revenue you could have earned with only a high school degree from age 14 to age 65. Here you can assume you will work until 65. * Kantrowitz, Marc. 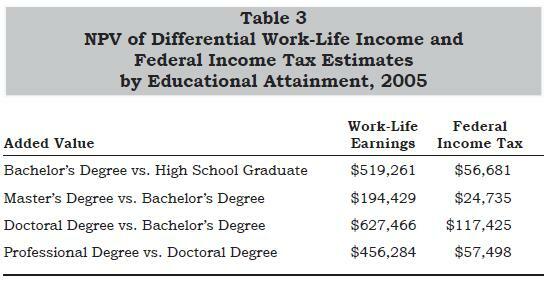 “The Financial Value of a Higher Education” NAFSAA Journal of Student Financial Aid, Vol. 37, No. 1, 2007. In Canada, we celebrate labour day by not working. Sounds contradictory? Well, if we trace back the origin of this celebration in the late 19th century, we find out that labour day originates from labour union mouvements that were demanding better work conditions. Fast forward to today, labour unions are losing power in large part due to the changing nature of workers. Jobs are becoming more precarious, workers more mobile and temporary because of the important shift from primary and secondary sector jobs to the service sector, where unions have historically had more difficulty making in-roads. Further, labour laws are still largely based on the typical full-time employment relationship that is becoming rarer and rarer. The end effect is that workers are facing more precarious work and less legal protections. Labour day in Canada was first celebrated with a march in support of the Toronto Typographical Union's strike. Perhaps we need to remember why we celebrate Labour day and give a new meaning to the holiday given the new reality of jobs today. For more information on labour laws in Canada, please see my report on the subject.